Apple has turned its focus on the education market with the launch of its new iPad. It's a great device for all, but the Cupertino company is also hoping to woo teachers and students with cheap pricing, dedicated software and Apple Pencil support. The latest iPad joins the company's current lineup of the Apple iPad Pro 12.9, and the Apple iPad Pro 10.5 replacing the Apple iPad (2017) model. The iPad, now in its eighth year and sixth generation, retains the same design as the 2017 release, but the Pencil support comes to a non-Pro Apple tablet for the very first time. Following our dabble at the Apple Field Trip event in Chicago we've been using the new iPad in our day to day lives to find out whether it should be your next purchase. The new iPad 9.7 keeps the identical design of the previous 2017 model, which is no bad thing. It looks great and is well balanced in the hand. Keeping the design means you get a 9.7-inch bright and crisp screen on the front, thin bezels down the side, a Home button and TouchID. There’s a front-facing camera for video calling, and a rear one for taking pictures or videos. Against the Pro 10.5 the bezels do look a bit thick, but nothing to be overly concerned about. For those that like to showcase, Apple has a new variant with a gold finish. It's the same as the iPhone 8 and Watch 3 designs, and is much more "gold" in colour than the previous rose gold offering previously available - we reviewed the Space Grey model. The screen is upgraded to interact with the Pencil, but can still be very reflective. Pencil is one of the cool add-ons for the iPad Pro range and now comes to the entry-level iPad. That’s great for those looking to annotate notes, draw, or use the Pencil in a host of "magical" other ways. We’ve been using the Pencil on a Pro for the past couple of years and use it a lot. It’s especially handy when it comes to signing documents or drawing on images to illustrate what needs doing. As with iPad Pro use, the Pencil is incredibly responsive. It enables you to draw on the iPad screen with zero lag and it's the same here. The Pencil is aware of the pressure you’ve put on it, allowing you to shade and also draw darker or lighter lines. It's not just about drawing. Other apps support Pencil too, including Apple's own Pages app. A new feature allows you to add drawn annotations to the copy that move when you edit the page. It's very clever, works between Apple devices, but you and whoever you are sharing the document with have to be using Pages. It doesn't work cross app nor supported by Microsoft Word at the moment. For the education market in the US, Apple has teamed up with Logitech to make the Logitech Crayon. It comes with a few differences and costs $49. Crayon is a more child-friendly offering from Logitech. Apple has worked closely with the company to create it, but there are differences between the two. The two big things to note are that there is no pressure sensitivity or Bluetooth pairing. To find out more read our Logitech Crayon vs Apple Pencil: What’s the difference and which one is best for you? article. The new iPad now gets the Apple A10 Fusion processor, which is found in the iPhone 7 and iPhone 7 Plus. It means the iPad can do most things, including 1080p HD video recording, running AR apps with a breeze, and pretty much cope with most things you can throw at it. Which Apple iPad is best for you? We noticed in our brief play that it’s not as powerful as the A10X processor found in the Pro range, but it runs smoothly and efficiently, especially if you aren’t being super demanding. According to Apple, it delivers up to 40 per cent faster CPU and 50 per cent faster graphics performance over the A9 chip in the previous-generation iPad, while still delivering up to 10-hour battery life. The battery life performs as expected. Use the iPad as a laptop and you'll still get a days battery life from it. Use it for general surfing, watching Netflix, and playing games and you'll get much longer. Put simply the battery life is good enough to give you a fantastic experience. It would have been nice to see fast charging though as found in the newer iPhone models. Elsewhere, you get stereo speakers rather than the four speakers found in the Pro range, and cellular versions for those that want to be connected to 4G on the go. There are 32GB and 128GB models for storage. The 9.7-inch screen delivers a resolution of 1536 x 2048, which is great. However, you won’t get the ProMotion or TruTone technologies. That's for Pro users only, sorry. On the camera front, there is an 8-megapixel rear sensor with a 1.2-megapixel front camera for selfies or FaceTime. Camera quality is still good enough though. To coincide with the launch of the new iPad, Apple has updated it's iWork range of apps, including Pages, Numbers and Keynote. They each now support Apple Pencil on iPad. Whether that's drawing directly in the apps or annotating work with a new feature (currently in beta) called Smart Annotation. It allows you to add comments and notations with Apple Pencil that dynamically anchor to your text in Pages. That's a lot more accessible than previously. The iPad comes with iOS 11.3 that adds a number of enhanced features for iPad users above and beyond what you get with the current version. GarageBand and Clips are among other apps being improved and enhanced. Also, because the Apple Pencil has already been available for some time, there are plenty of third-party apps that support the stylus, including Pixelmator, GoodNotes 4 and the soon to be released Froggipedia. The latter turns the Pencil into a virtual scalpel. Basically, there are over 1.3 million apps on the App Store for iPad and many work with Apple Pencil. How much does the new iPad cost? The new iPad (sixth generation) comes in silver, space grey and a new gold finish and starts at an Apple retail price of £319 for the 32GB with Wi-Fi model and £449 for the 32GB Wi-Fi and Cellular model in the UK. There is also a 128GB model, if you want to max out on storage, and that costs £409 in the UK and $429 in the US. That’s £20 cheaper than the previous version. If you’re in higher education in the UK, it’s around a further £30 cheaper still: starting at £299. The Pencil is still an optional extra, costing £89. That is £10 cheaper than before. Unlike the Pro range, there is no option of a Smart Keyboard, as the iPad 9.7 doesn’t feature the smart connectors to recognise one. The next iPad Pro 2018: What's the story so far? Probably the biggest question when it comes to the iPad (6th gen) is should you settle for this one over the iPad Pro 10.5 given they are very similar in size. 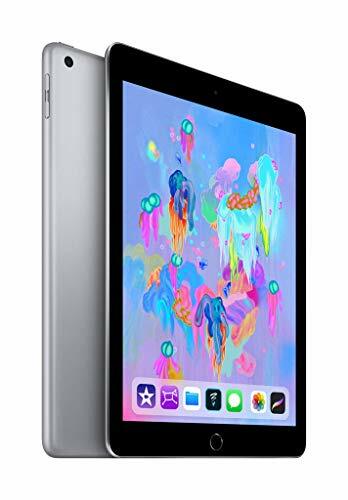 While the specs of the Pro model are of course better in virtually all regards, the iPad (2018) is still a very good machine that will service most people's tablet needs, especially if you are planning on using it for games, watching Netflix, or drawing. The screen is great, the speed ample, and the sound still very good. The new iPad replaces the now-old, defunct 2017 iPad. The addition of Pencil support is very much welcome and is likely to appeal to many. While Apple is happy for anyone to buy the new tablet, and a lot of people do, Apple's focus on education for its new device is an interesting one. Just imagine what a bevy of iPads coming to the classroom can mean. Whether that’s using it for AR or just to jot down notes, it’s likely to be hugely successful. If schools can afford it, of course. If you're not buying this to use in the classroom, the iPad still very much delivers for the rest of us. It's taken what was already an amazing tablet and added more technology for a cheaper price. That's hard to argue in anyone's book. If you've been holding off buying a new iPad for a while, and still aren't interested in the Pro range (we like the 10.5 model), then this is as good as it gets from Apple. While the iPad (6th generation) now features Pencil support, there are a number of things it still doesn't offer compared to the Pro 10.5. That includes Apple's TruTone and ProMotion screen technologies, quad speakers, those thinner bezels, and an A10X Fusion chip (the iPad only uses the A10 Fusion Chip). Additionally for working on the go there is the Smart Keyboard that takes its power from the iPad rather than needing to be charged separately. As it stands, the Android tablet market is a little bare, but the Pixel C shows off the best, cleanest version of Android in a stunning piece of hardware. It's really well made, has a great screen and is fast enough to cope with pretty much anything. It costs nearly £500, however, which is some premium over the regular iPad. Read the full review: Google Pixel C review: Pixel perfect? If you want a great Apple tablet without the size of the 9.7-inch iPad, the fourth generation iPad mini is an easy choice. Because the screen is smaller than the regular iPad, it's considerably sharper. It shares many of the features with the iPad 9.7 aside from Pencil support, but just has them in a smaller package. It does, however, cost a little more than the iPad.